If your team is in danger of being caught by the zombie horde, you will receive an alert that the zombies are within striking distance. If your team is caught by the zombie horde, all team members will begin to take health damage. This applies to both the rearward-chasing zombie horde and front-facing pockets of zombies. The amount of damage that you take is determined by the HORDE FEROCITY, which you can find on the DOSSIER that’s accessible from the gameboard menu. 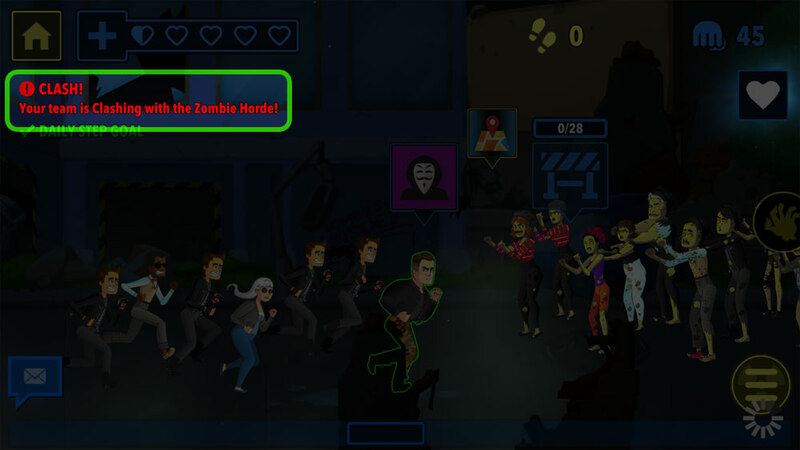 Note that the horde’s ferocity increases each week in the mission, so being caught by zombies in week 6 is a more imminent threat than in week 1. While you move as a team, all players have their own individual health, and as such, heal individually. It’s up to you to heal yourself using POWER that is earned through exercise. If your health reaches zero and you fail to heal yourself for over 24 hours, you will be turned into a zombie.